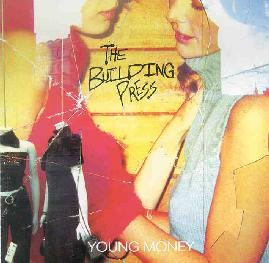 The Building Press - "Young Money"
The Building Press is a Seattle based trio that play an aggressive, punky, and complex brand of rock that bears strong similarities to Captain Beefheart, as well as including sprinklings of Can. The band consists of A.P. Schroder on guitar and vocals, Jeffrey Woodke on bass and Eric Junge on drums. Young Money is their second album. Among the highlights is "It's Probably Just You", a very cool mixture of Can and Captain Beefheart with a punk rock edge. The music is aggressive and a bit angst ridden, but The Building Press manage to communicate raw energy out of intricately composed rock constructions. "Operator Manipulator" draws on similar Beefheart stylings, but also avant-garde influences. "Bragging Rights" is one of my favorite tracks, cranking out The Building Press' trademark aggression but within a strange sort of punk rock/prog rock glom, and is another song that includes elements of Can. "If You Think I Can't Get To You... You're Wrong", "Textures" and "Disappointment" are considerably mellower than the other songs, though the grungy rawness and thoughtful complexity that characterizes the album is still there, and the latter two have a somewhat more freeform jam quality to them. My jury is still out on whether a lot of this is more chaotic than substantial. Songs like "Bragging Rights" are proof that when things come together it is tight indeed. In any event, I'd say these guys are definitely on to something and I'll want to hear where they go next. The Building Press get a thumbs up for not just standing outside the box, but stomping on it too. For more information you can visit the 540 40' or Fight! web site at: http://www.fiftyfourfortyorfight.com. Contact via snail mail c/o 540 40' or Fight! ; PO Box 1601; Acme, MI 49610-1601.